Hi Friends! Today, I wanted to share with you a technique I am calling Stamp Embossed Resist. 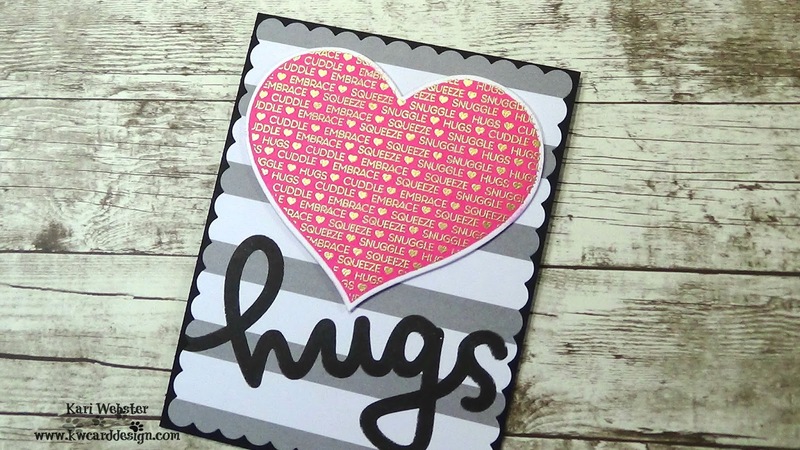 I recently purchased some new products from Concord and 9th, and I thought it would be fun to use the solid heart image from Heart Smile, and combine it with the sentiment heart image, from Cuddles and Hugs. I made three cards using this technique, and I wanted to share how all three came together. As always I do have a video tutorial to share, and any of the products I've used are listed/linked below! First, I have the more "complex" card of the three. 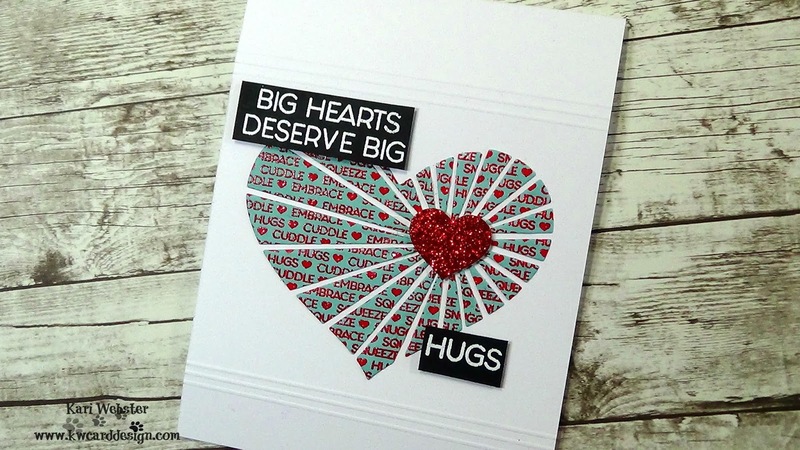 With all of these hearts that you see, I started out by embossing the sentiment heart - two in gold embossing powder, and this one is WOW Red Apple. I love the look of this red powder! And, it embosses wonderfully! 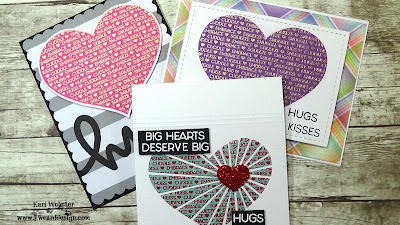 I didn't line up my stamp as well as I should have as you will see in the video, so I die cut this heart using the Heart Strings Die from Concord and 9th. For the white card base, I wanted a bit of something extra, so I took my scoring board, and created three scored lines about 1/8" each apart on the top and bottom framing in the heart. The die cut pieces were left in the die intentionally, and it helped me adhere these small pieces onto my card base. 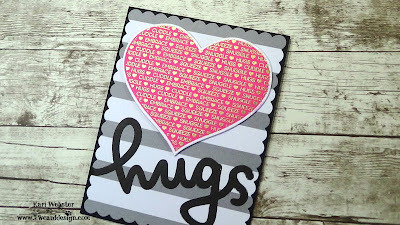 I added two more complimentary sentiments from Cuddles and Hugs and I stamped and embossed these sentiments giving a nice contrast with the heart design, and white card base. 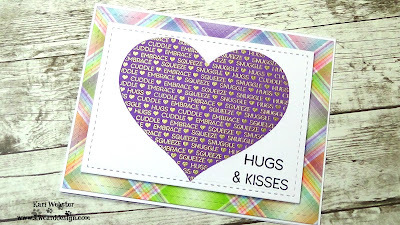 For the next two cards, I went a bit more simple, and I die cut this heart panel with a Right At Home Stitched Rectangle Frame ( one of my favorites), and this created a nice panel to adhere to some patten papers from Lawn Fawn's Perfectly Plaid Rainbow. I also added an additional sentiment to finish off this card design. For the third and final card, I used some pattern papers from Concord and 9th, and I die cut that using a scallop rectangle from Lawn Fawn, and stamped the large HUGS greetings from Cuddles and Hugs - using my MISTI stamping tool. 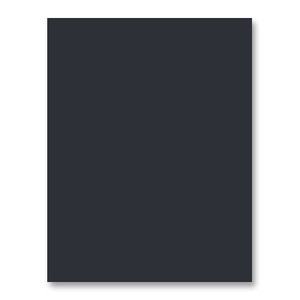 I added some foam adhesive to the die cut heart, and added this to my black card base. I have the video below for more depth into how these cards came together! Have a great week! 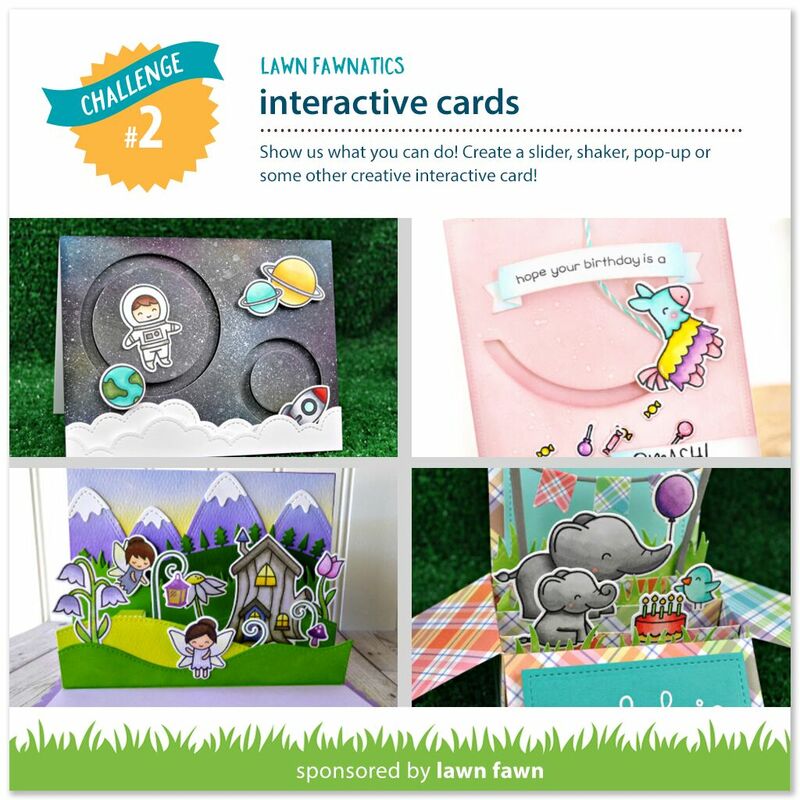 I am back to share with you my entry for the next Lawn Fawnatics Challenge: Interactive Cards. I will be quite honest, I am not very confident when it comes to coming with innovative ideas for interactive cards, but I thought this card turned out pretty good! One of my all time favorite sets is Our Friendship Grows. So, I thought it would be fun to create the centers of the sunflowers as little shaker elements. 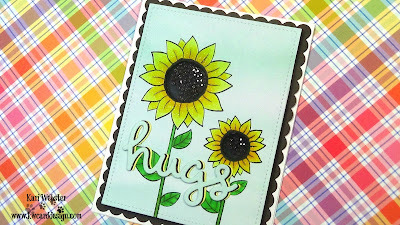 I knew going into my design that I was going to have enough bulk with this card because of the foam tape on the card for it to be popped up enough for the shaker elements to move freely, so I decided to stamp my sunflowers directly onto a piece of the blue Watercolor Wishes pattern paper. From there, I colored in my images with my Copics, and then I backed my pattern paper with a piece of white card stock for it to have enough stability. I took my craft knife and carefully cut out the centers of my flowers. I wanted to add some highlights, so I just took my white gel pen and added right onto the acetate window a few white highlight dots. 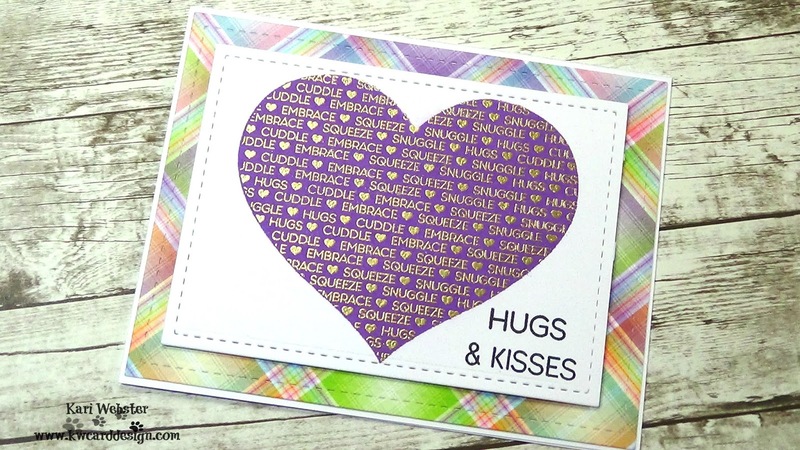 For my sentiment I die cut the Scripty Hugs three times from yellow, light blue and brown card stocks and it really brings out the sentiment. I added my shaker panel to a die cut scalloped frame, and then onto my A2 white card base. For final embellishment, I added some Wink of Stella shimmer to my flower pedals.